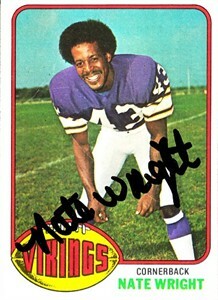 1976 Topps football card autographed in black Sharpie by cornerback Nate Wright, a mainstay for the 1970s Minnesota Vikings teams that reached three Super Bowls. Obtained in person, with certificate of authenticity from AutographsForSale.com. ONLY ONE AVAILABLE FOR SALE.